Morgan searches for Alicia in the hurricane. Instead, he finds a walker. The rain ultimately drives him to hole up in the back of an eight wheeler. Inside, he checks boxed. "Take what you need. Leave what you don't," the boxes read on inside. They have water, supplies, and toy trucks. He also comes across a pocket knife and protein bars (eventually one of peanut butter flavor which is the flavor he enjoys). Night falls and Morgan sleeps in the truck. The next morning, he wakes up to the sound of walkers outside. Cracking the door, he uses his spear to put it down before walking outside. Looking up at the gas station he is outside of, he sees a sign which makes him realize: Morgan is in Mississippi. He investigates inside the gas station. No one is answering but the coffee maker has been used recently. The lights work when he flips them on, prompting a defensive stance. A woman begins talking to him over the radio. She is asking for "Polar Bear." He tells her he is in Mississippi and she is welcoming to the idea. Fear the Walking Dead's opening credits play. Morgan navigates the gas station and makes himself some coffee. He thoroughly enjoys it. He notices this gas station has running water, reading material for the bathroom, and toilet paper. While using the bathroom, a shotgun pumps and tells him to get out. Morgan asks for permission to finish up. "All my life, people like you been using stalls made for people like me," the man says when Morgan opens the door. He is wheelchair bound with a shotgun pointed at him. "It's gonna be honest," Morgan says. "It always seemed like a little apartment." The man agrees, it is, especially when it has a sink. Moments later, they discuss Morgan's conversation on the radio. A woman walks in and asks Morgan to excuse her brother. She's a white woman. He's a black male. "We're twins," he says. Later, the woman shows Morgan their trucks full of supplies. They would have satellite TV if anyone was still broadcasting. Morgan wants to know if there are more places like this but they don't want to open up about it. He tells them he is going back to Virginia to "a place where people were trying to start over." The man insists he saved Morgan from the hurricane and got him 40 miles closer to the hurricane. They insist Morgan's people from Texas are gone. As Morgan heads off, they help him with directions. They do good because they have a code. "We got a code and we keepin' it alive," the man says. "You gotta help people when they need that help and then you gotta keep yo' truck movin'...Keep on truckin'." Morgan starts his drive, coming across down trees and pinned walkers. As he navigates the roads, he comes across more supply boxes which make him happy. He eventually hears voices and turns around, wrestling with the idea of whether or not he should continue and which way to go. He radios back to the people and asks if they really know which roads are clear. He lies and says the bridge is out, heading back to them instead of Texas. Sarah and her pal are riding out in their truck. They radio Morgan to let him know where there is trouble. He is struggling with not helping Alicia's group. Morgan drives out and comes across a man running through a field with his hands cuffed and a bag over his head. He rescues the man from walkers which were about to eat him and takes the bag off of him. The man has beer on his breath. Someone was trying to kidnap him, wanting recipes for beer. They ride out together. The man promises Morgan he has the future. "One day, everything that we lost, we're gonna rebuild," he says. "We're gonna start again. It's inevitable. I make beer." Morgan doesn't think he's nuts. He reveals he is headed to a place where people are trying to rebuild and invites him along. Morgan's new friends have been looking for the beer maker. They are the kidnappers and have been looking for this man. Morgan and the beer maker are now held captive in the back of the truck. Wendell and Sarah left the person who used this truck on the side of the road. They want to know where Alexandria is. Morgan won't tell them. They decide to start driving toward Virginia, hoping he will talk later. Jim (the beer maker) and Morgan sit together in the back. Jim analyzes the supplies and realizes he can make beer. He thinks Morgan should just admit to them where Virginia is. Jim tells Morgan that his micro-brewery was sold to a multinational conglomerate. "I was about to cash in," he says. "I was supposed to be rich and those dead things stumbling around out there took that away from me so just let me get it back. Tell where we're going." The truck stops and they get out. 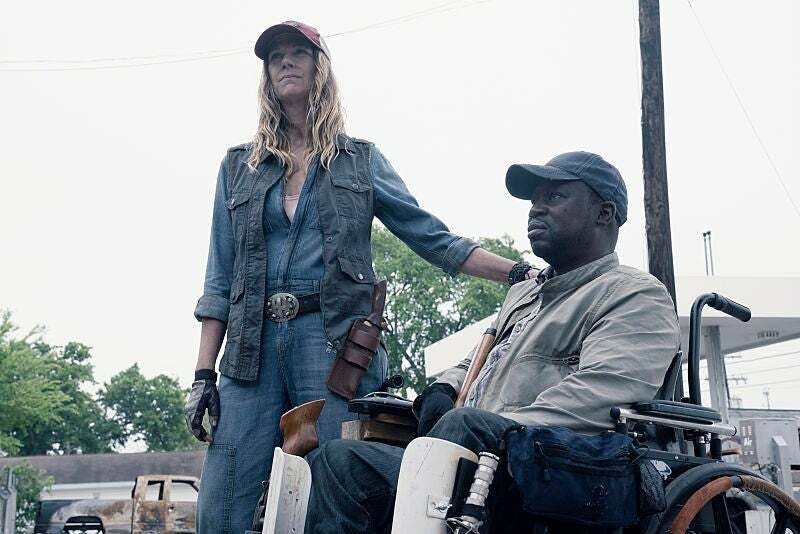 Jim starts to tell Wendell and Sarah that he is not going to give them a recipe for beer but he'll make it if Alexandria turns out to be a good place. They turn to Morgan and suggest he start talking but a herd of walkers starts approaching. Jim trips and pushes Morgan toward the small herd and he has to run but can't get up the hill. Over the radio, Sarah suggests she will help him if he'll tell them where Alexandria is. He is surrounded by walkers on top of a car. "81 Exit 77C" Morgan tells her. After a billboard for cat food, they turn left, go about five miles, and they're there. They decide to leave Morgan behind just like her left his friends behind. He is stuck on top of the truck with his hands tied behind his back. Night has fallen. Morgan sits atop the truck, still surrounded. He uses the radio to tell Sarah they don't have to do this and they can come back. "I know you can hear me," he says. "I'm just gonna say it. I could've crossed that bridge, could be on my way back to Texas right now but I'm not. Had a little bit of time to think about here and I'm a coward. I helped those people back there, at least I thought I had but it wasn't enough. I could see that. They needed something and it was something that I could not give them, didn't think I could, so I got scared. Scared that if I went back I would just make things worse so don't you come back. Not for me. I can't ask that. Maybe I can ask you to come back just so I can do the right thing." No one responds. One by one, Morgan starts kicking the walkers. They get a hold of his foot and almost pull him off. He gathers himself and gets an idea. He leaps over them and onto the hill, ultimately sliding back to them. He sees a mile marker and a torn up box of supplies. He makes his way to the switch blade and cuts his hands free before killing two walkers and grabbing the street sign to kill more. Later, he walks down the street with his new weapons, radioing for his new acquaintances. He tells them they were wrong about the boxes not doing anyone any good. Morgan comes to the bridge he refused to cross earlier and finds Wendell and Sarah. They realized he lied about Alexandria's exit. They argue about what to do and Morgan thinks helping people is right. He will only tell them how to get to Virginia if they help him pick up his friends first. He also wants to pick up other people along the way. Every 10 miles they stop and plant a box of supplies. Morgan radios for the people whose truck it is and tells them he is bringing the truck back. Jim plants a box and puts a bottle of wine in it. "You hang on, because we're coming," Morgan says. "We'll see you on up the road." A woman hears the radio call and marks a walker pinned to a wall in the gas station. He's fresh. She laughs and tells him they're going to Texas.